As you are concerned about the information you write here on over website, especially when it comes to your credit card, social security number etc, Following basic points of our policy regarding your privacy will definitely turn you satisfied with buying from williamjacket.com. • Your information is solely used by williamjacket.com to communicate with you regarding products and services that you are interested in. • Williamjacket.com uses an SSL (secure socket layer) for order processing to ensure the safety of their customer’s personal and credit card information and retains all personal information in a secure location where it remains for our exclusive use to ease future transactions with our customer. Such information remains protected with us until a customer requests its removal or until management deems it necessary for removal. • No third party or any other company can have any access to any purchasing information of yours. • Email Address and a password when you create your account. You can browse this Site without creating an account, but you will need to create an account when you purchase something and in order to take advantage of certain features, such as “Save for later,” and the other williamjacket.com services. • This is to ensure that no one else can deal with us regarding your order we may ask you to confirm your personal information when you contact our Customer Service department. This will allow us to maintain confidentiality by verifying our customer’s identity. Please Note that no credit card information is collected – we collect the above-mentioned information only in order to correctly process and ship your order. This includes the name, address, and phone number of the intended recipient(s). you can choose to save your billing information in “Your Account.”. You may change or delete this saved information anytime. Simply go to Your Account, login with your email address and password, in order to “Change Your UserName, Email & Password” or to edit or delete whatever personal information you wish. 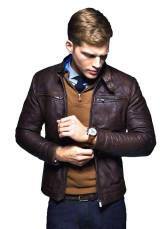 We collect personal information from customers who wish to use any of William jacket services, including but not limited to, williamjacket.com Products, Gift Items. In order to use these services, you must provide your email address and password or create an account. When you visit williamjacket.com, a permanent “cookie” (a small text file) will be stored on your computer’s hard drive. The purpose of storing the cookie is to identify you when you visit this Site so we can enhance and customize your online shopping experience. We also collect certain technical information from your computer each time you request a page during a visit to williamjacket.com. This information may include your Internet Protocol (IP) address, your computer’s operating system, browser type and the address of a referring website, if any. We collect this information to enhance the quality of your experience during your visit William Jacket and will never sell or share this information with any third parties. Please note that each browser is different, so check the “Help” menu of your browser to learn how to change your cookie preferences.